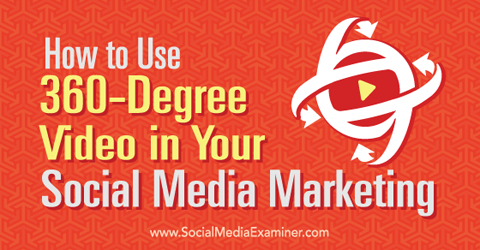 are you using video on your social channels? 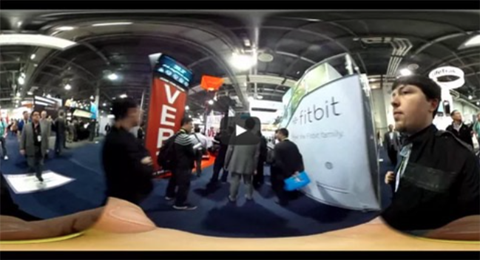 Have you thought about 360-degree videos? In this article you’ll discover how to create a 360 video and use it for your business. 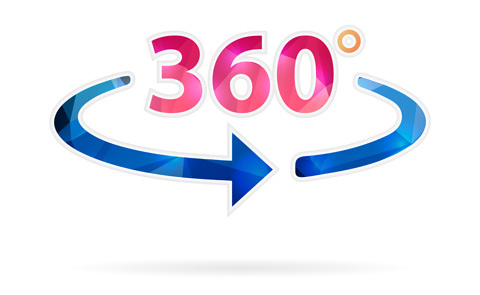 360 videos (also known as VR or virtual reality) are clips displaying a spherical scenario where the camera has recorded all possible angles of the environment. Discover how to use 360 video in your social media marketing. When watching 360 videos, you can interact and choose the content you’re viewing. On a computer, you can view 360 videos with Chrome, Opera or Firefox. Click and drag the mouse on the video to see different angles. You get an even better viewing experience on mobile. Simply move your smartphone around to see different angles. You can enhance the mobile experience by watching the video in a Cardboard viewer, which allows a 3D-interactive experience of the video. 360 videos are not new to social media, as YouTube introduced them in March 2015 and made them available for video ads a few months later. Since then, a few companies have embraced the new technology, producing videos that leave viewers amazed. More recently, Facebook has also made this technology available, which is likely to contribute to starting a new social media trend. Creating a 360 video is easier than you may think. The software provided with your camera and the social network where you host the video manage most of the process. You don’t need any advanced knowledge of editing software. The creation process isn’t as hard as you think. Image: Shutterstock. Creating 360 videos requires a special camera with lenses that cover all of the angles around the camera. It’s also possible to create these videos by using six cameras recording simultaneously in a cube configuration. However, this process is usually more complex and requires advanced editing. Some of the camera models currently on the market are Ricoh Theta, IC Real Tech, 360Cam, Nokia Ozo and Bublcam. To record a 360 video, you need to change your mindset for a whole new technology, remembering that you’ll be recording everything around the camera. With traditional video, you might have props hidden outside of the frame to help you with your video, such as a teleprompter, other people, etc. All of this would be seen in a 360 video. A 360 video uses the same file format as any other video, and can’t be visualized in spherical mode without using specific software (or a social media network). All of the cameras provide their own apps to preview your videos, which gives you an idea of the final result. However, remember these applications are just viewers. The video file is not converted into any special format. Before publishing 360 videos online, you can edit them with most editing software to include titles and buttons, adjust color, merge clips, add background music, and so on. When editing, you’ll be working with a strange image format that is just a flat-stretched representation of a spherical recording, as shown here. Editing 360 videos requires some practice to work on the flat representation of the clip. This view can make the editing process a bit challenging in the beginning. But in reality, editing a 360 video is no more complex than editing any other video. Finally, the most important and easy step of all is to upload your video. The process is as simple as uploading any other video. Both Facebook and YouTube will automatically recognize the clip as a 360 video, and prepare it to be viewed. Nothing else is needed. Creating 360 videos is a relatively simple process. If you’re ready to get started with 360 videos for your business, here are some ways to use the ideas below to boost your social media engagement. Nescafé is one of the first companies to see the potential of this technology. The company is currently using it to show viewers how their coffee is produced. In the following video (part of a series), the company shows users the first step of the production process: the collection of coffee beans. The campaign goes one step further with a mobile app for iOS and Android that includes additional videos. The company is also giving away 10,000 branded cardboard viewers in 13 markets during events and as prizes for online competitions. With this campaign, Nescafé not only shows users the freshness and natural gathering of their coffee, but also produces great branding while generating new leads. Another company that effectively uses 360 videos to involve users with its products is Mercedes. During this year’s IAA Motor Show in Frankfurt, the car manufacturer presented some concept cars, as well as other models. Mercedes didn’t want the experience to be exclusive to event attendees only, so they created this video as a way to increase user engagement and extend the reach of their message. You’ll find some of best applications of 360 videos in the tourism and hospitality industries. Qantas has been successfully promoting some of Australia’s most popular destinations with 360 videos. In the following video (made in collaboration with Hamilton Island Resort and Samsung), Qantas not only focuses on the location (which is impressive on its own), but also lets viewers experience what it means to travel to that destination with Qantas. As such, the video includes shots from the cockpit during flight and landing, as well as the passenger cabin. You don’t have to be a multi–million-dollar global company to use this technology though. In fact, 360 videos are becoming popular among travel bloggers and YouTubers, who often have limited budgets and technical resources. Many times, viewers put more trust in their opinions, as they feel a personal connection. Who doesn’t like watching action videos of nearly impossible activities that can be performed by only a few select daredevils? Most of us don’t have the skills (or courage) to do things like bungee jumping or wingsuit skydiving, or driving a Formula 1 car. But we’re still curious about what it feels like to experience those adventures. As expected, Red Bull is an early adopter of this technology. Keeping with their strategy of featuring adventure sports to promote their brand, they’ve taken this one step further by allowing users to be part of those incredible experiences. Adventure sports can also be used to promote outdoor locations in a much more active way, as in the following video produced by the Norway Tourism Office in collaboration with Red Bull. Move the video (look up in the sky) to see how branding is implemented. You’re likely familiar with Zach King, the Internet celebrity who became popular by creating micro-videos that include himself doing magic tricks. Now Zach is also creating 360 videos with the same type of content. Not only does he continue to bring the wow effect, but this new video format lets viewers be part of the action, too. Other video bloggers with a more traditional approach to content use 360 videos as a way to let their followers be part of the stories they’re sharing. This is a great way to increase engagement. This is the case for Louis Cole, who produces daily videos of his travels around the world. In the following video, you can see how an average topic gains new levels of interest when viewers can join the action and be part of the moment. Promoting an event usually requires showing pics or videos of what people can expect at that event. What better way to do this than to let people be part of that event? When YouTube launched 360 videos in March 2015, one the first channels to create content for this new format was Tomorrowland, one of the biggest electronic music festivals in the world. In fact, the following video was the first 360 video ever uploaded to YouTube. Another interesting application that some companies are embracing is short films. The idea is not so much to do a direct brand promotion, but rather to let viewers immerse themselves in a story where the company’s products are featured. This is what Mini is doing with the Mini Connected campaign, which is a series of short films that let viewers join the story. Mini is also using this campaign to generate leads by offering free cardboard viewers to users who want to experience the movies in virtual reality (that is, combining 360 videos and 3D). Dimension Gate, a virtual-reality video production company, has found an interesting way to promote their brand. Rather than use a traditional demo reel to show some of their best works, they’ve created a series of short horror films with the objective of generating virality, which in turn helps increase their brand exposure. You can watch one example (at your own discretion). Many artists are joining the 360 video trend as a way to boost their content reach and generate repetitive consumption. As you know, the more you listen to a song, the more likely it will get stuck in your head. Artists, however, find it hard to make people listen to the same tune over and over, unless they’re diehard fans. A great solution to this problem is 3D videos. Since it’s a challenge to see everything that’s happening in the clip, many viewers will watch it several times to satisfy their curiosity, thus listening to the tunes many times. This is what Swedish musician and DJ Avicii accomplishes in the following video clip. Wild Child, an Austin-based indie band with a smaller budget, used a similar approach. By alternating a series of short scenes, the band was able to produce a sense of immersion and make viewers want to watch the video over and over again. Wild Child – Rillo Talk (Virtual Reality)Virtual Rillo Talk what! We had a really weird afternoon making this video – never thought we’d be able to see it like this. One of the key success factors on social media is engaging with your audience. And there’s no better way to do that than by making your audience part of your content production. British television show Strictly Come Dancing has joined the 360 trend by letting viewers experience some of the best performances directly from the stage. This allows viewers to choose their own content, while incentivizing multiple viewings. Another great application of immersive television where viewers have control over what they want to see is nature documentaries. The following video from Discovery Channel is an excellent example of this. Ever wanted to swim with a shiver of sharks? MythBuster Adam Savage takes you underwater in Virtual Reality to explore up close! This is a great way to make users remember a particular show or subscribe to a paid television service. Although 360 videos in social media are quite new, their use is growing rapidly, mainly due to their content versatility and high levels of user engagement. Furthermore, the launch of these 360-degree videos on Facebook opens a new battlefront in the war for video supremacy currently held between Facebook and YouTube. In the hope of getting more traffic, it’s possible these networks will launch additional features to make 360 videos an even better option for brands and viewers. What do you think? What is your experience with 360 videos? Are you considering using them in your content strategy? What other applications can you think of? Please share your thoughts in the comments below.